Please find your Session newsletter for 05/29 – 06/02. 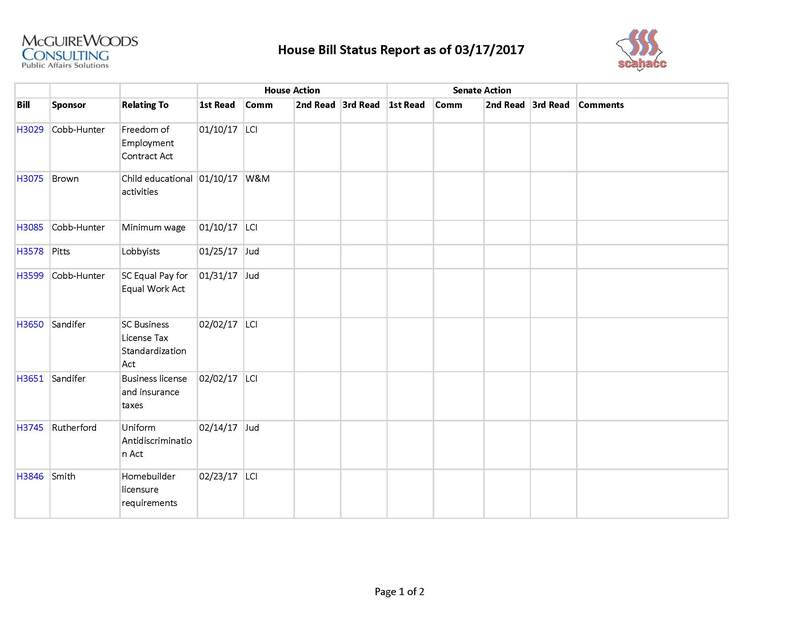 The House met on 5/23 as required by the Sine Die Resolution in order to take up the budget and vetoes, but due to the lack of business before the House, members were informed that unless they had other official business to attend to, it was unnecessary for them to attend session. 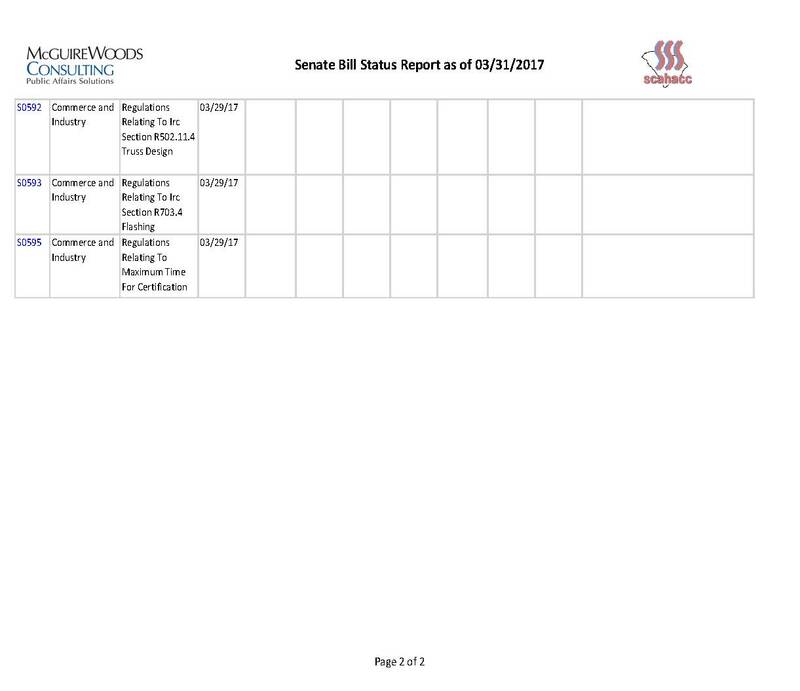 The Senate met briefly to ratify acts and approve S. 671, which received third reading and was sent to the House on 5/24. 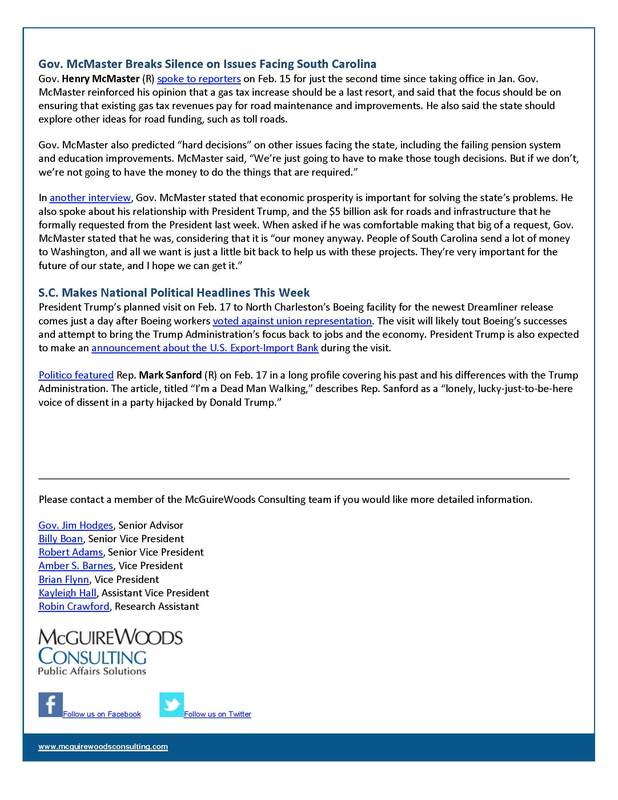 Please find your Session newsletter attached. 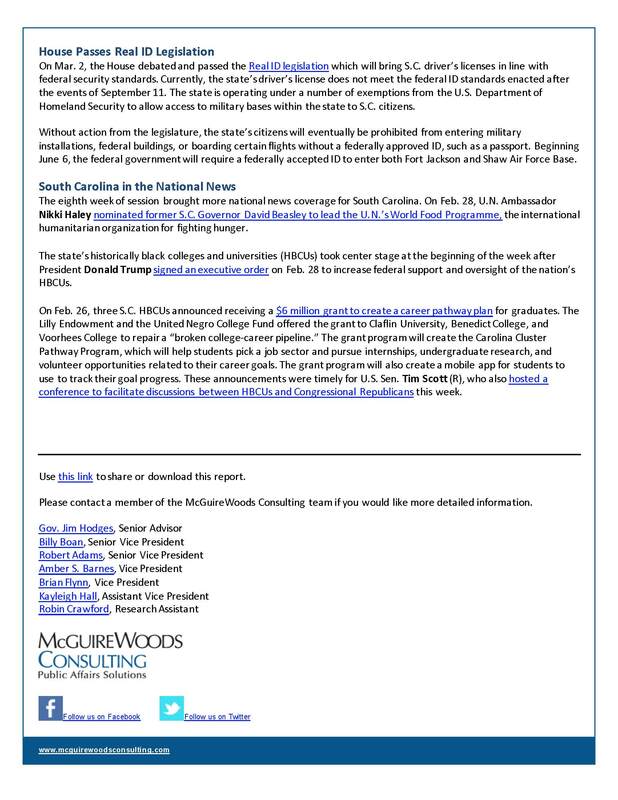 Click Here for 5/15 – 5/18 updates. · 5/8 – Attended H. 3516 (roads bill) conference committee. The conference committee finalized and signed their report after free conference powers were granted to them. 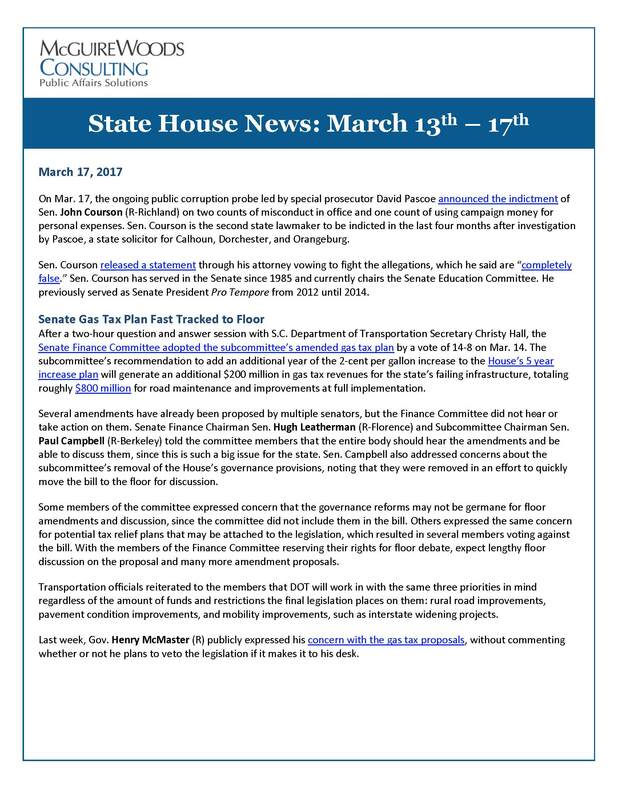 The Senate approved the conference report and on 5/9, the House approved the conference report and the bill was ratified. It was sent to the Governor for consideration that evening, who promptly vetoed the bill. 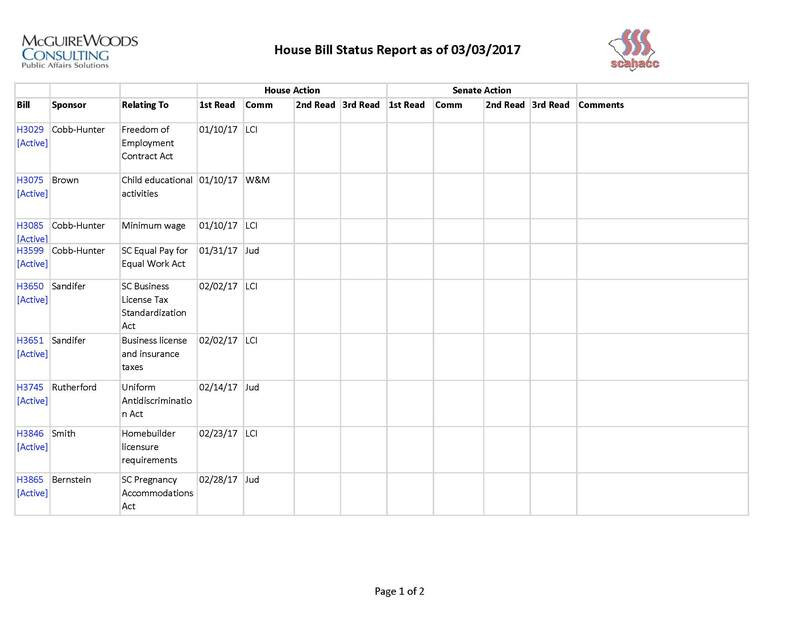 · 5/10 – The House voted to override Gov. 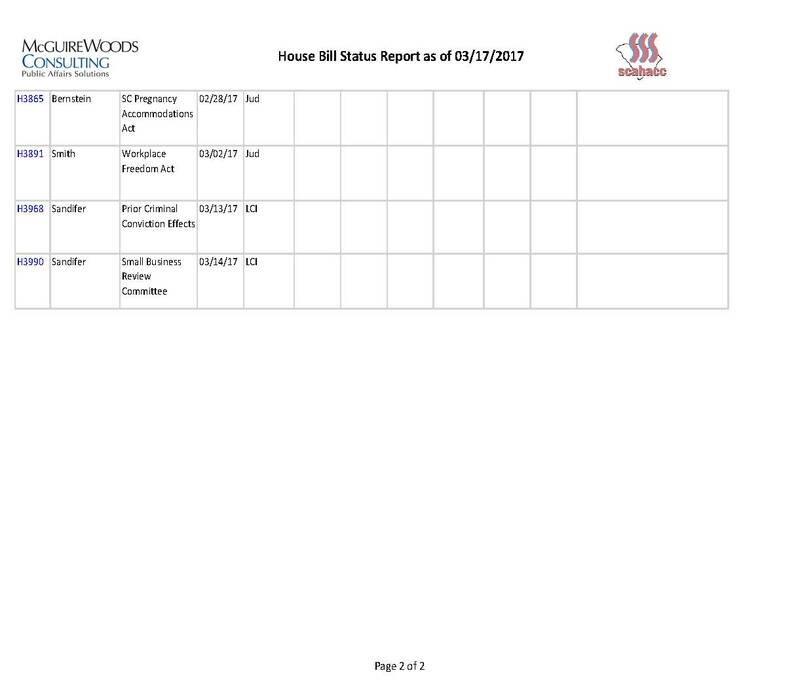 McMaster’s veto of H. 3516 (roads bill) by a 95-18 vote. Shortly after, the Senate also voted to override the veto by a 32-12 vote, with an effective date of July 1, 2017. Please see the attached document which explains the new law. 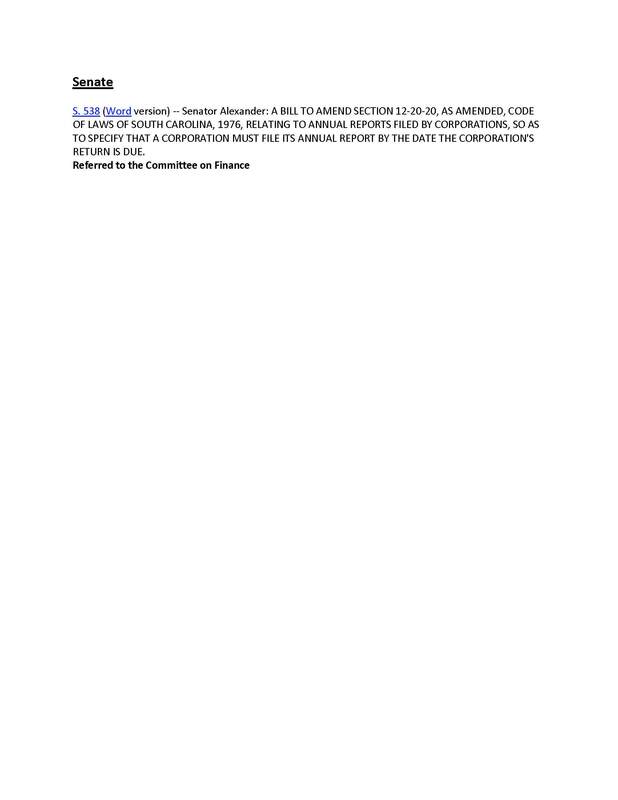 The business property tax breaks included in the Senate version did not make the final language. 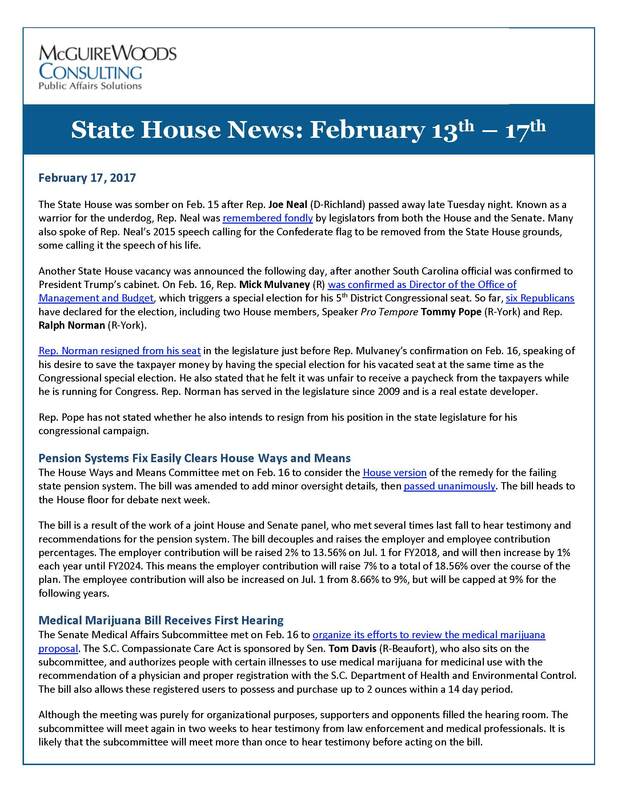 Please find your House and Senate bill charts, Session newsletter, and fact sheet attached. 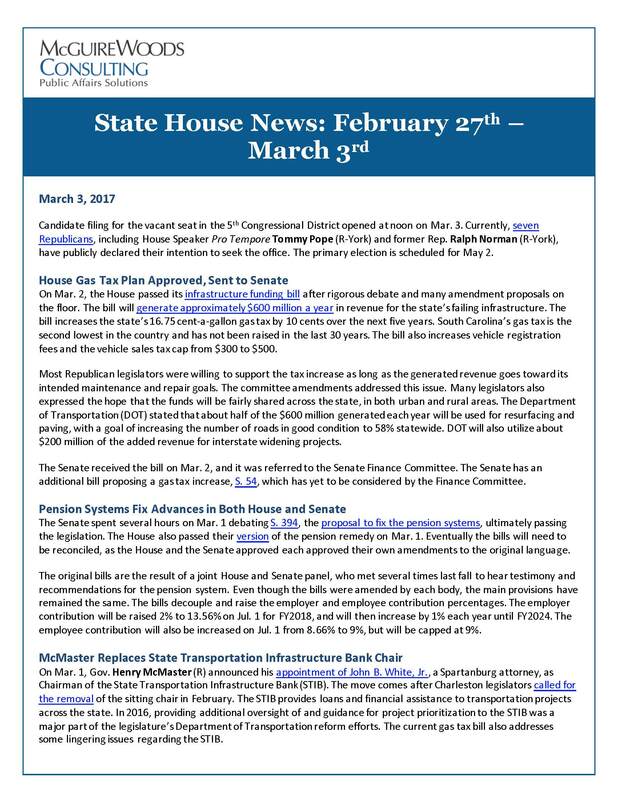 Please find your House and Senate bill charts and Session newsletter attached. o The bill mandates that all regulations promulgated after July 1, 2017 will sunset after 5 years. The goal is to force review of all future regulations to ensure they do what they are intended to do and that they are still necessary. 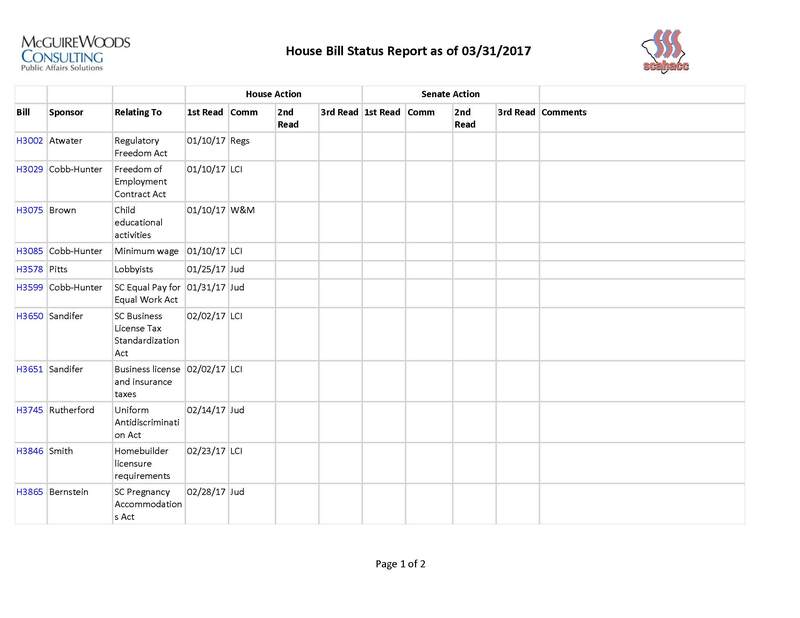 Please find your bill charts (Senate page 1, Senate page 2) (House page 1, House page 2), bill introductions, and session newsletter attached. 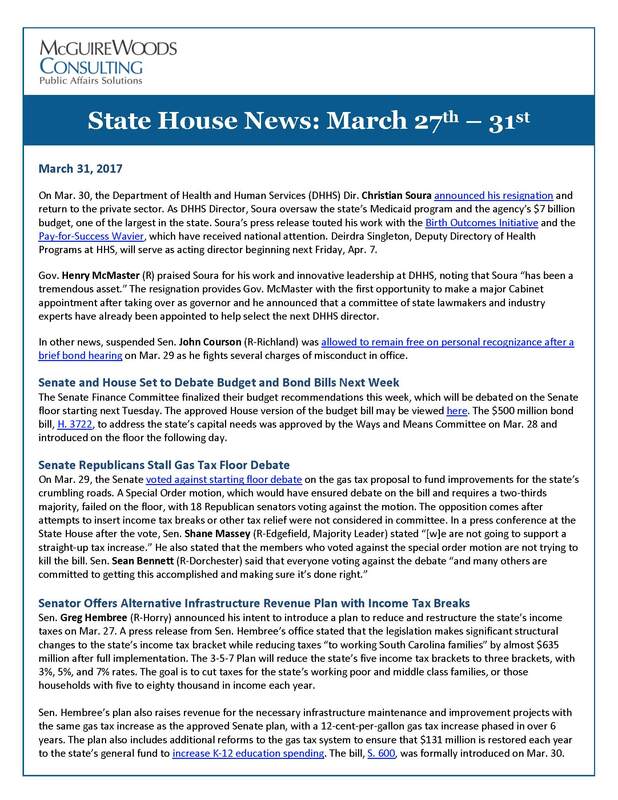 Please find your bill charts, bill introductions, and Session newsletter attached. 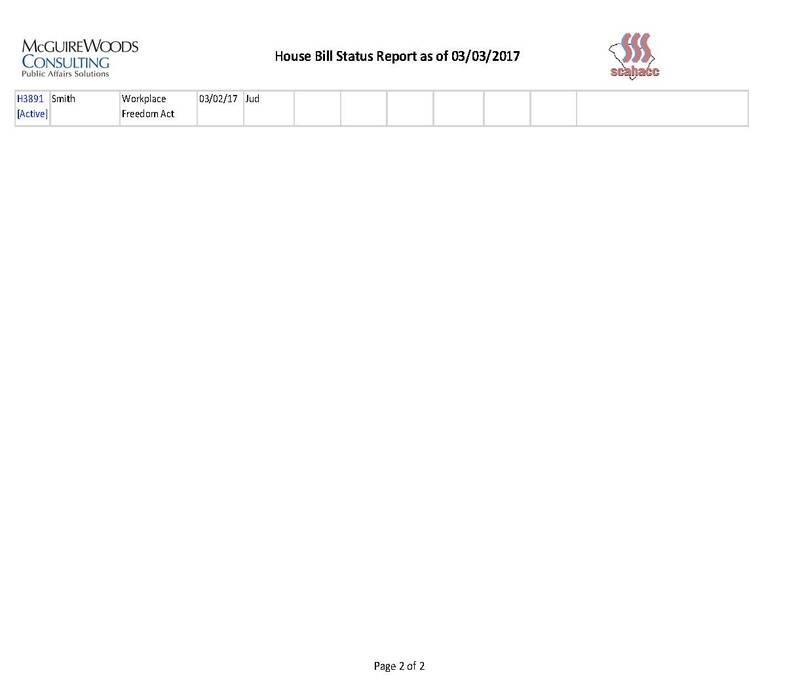 Please find your bill charts attached. 2/8 – Attended House LCI Executive Subcommittee for H. 3650 (SC Business License Standardization Act) and H. 3651 (business license taxes). 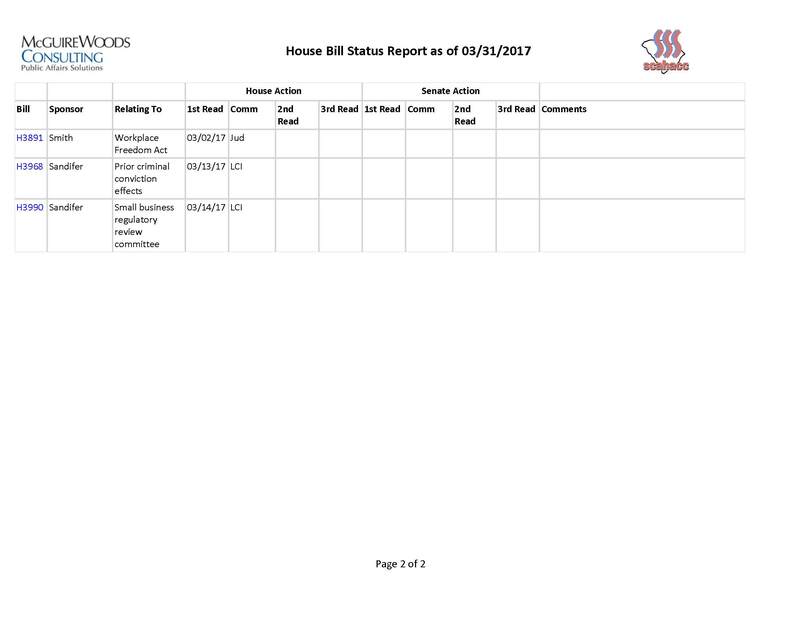 Both bills were amended then received favorable reports. 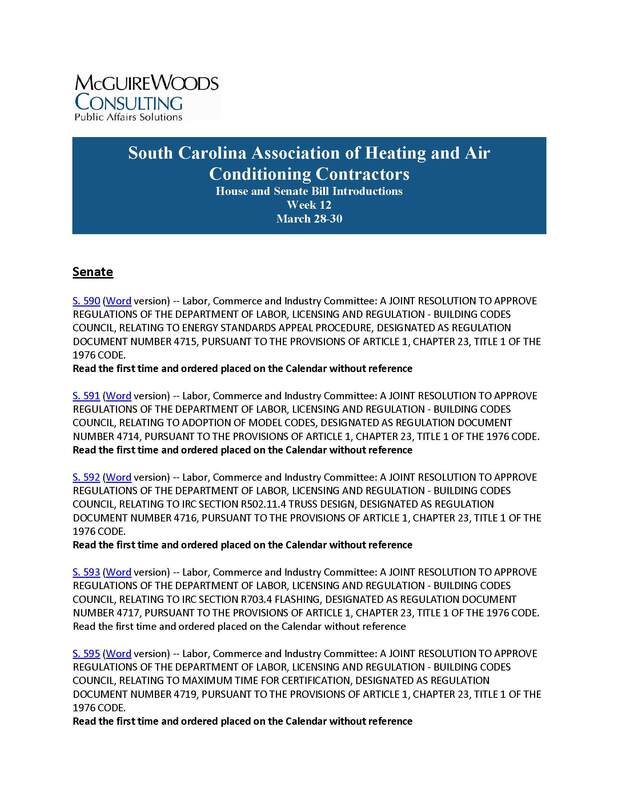 2/9 – Attended House Labor, Commerce and Industry Committee for H. 3650 (SC Business License Standardization Act) and H. 3651 (business license taxes). The committee passed additional amendments concerning how telecommunications tax is paid and collected, then received favorable reports as amended. The business community has made it clear they oppose paying a tax to a private organization. This is a delegation of each individual municipality’s sovereign authority that is impermissible and bad public policy. H. 3650 will ensure that businesses may pay their business license fees to one entity housed within the Secretary of State’s Office. The legislation creates an additional avenue for businesses to use to file their business licenses while it does not take away the current method. This bill does not take away the authority of the cities to set the tax rates, it will only require them to do it in open session, which is not currently being done in some instances. This is good governance that is necessary for transparency. 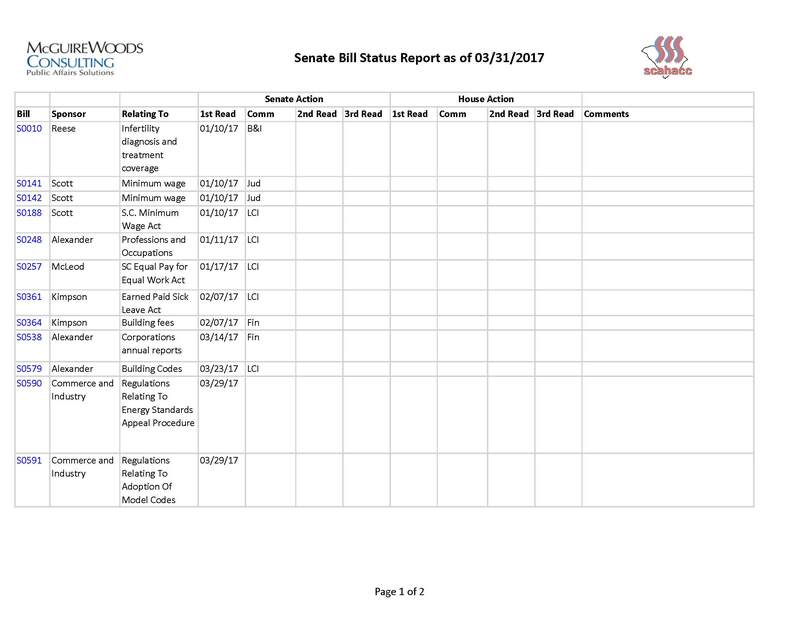 This bill creates a uniform filing date, a uniform application, and uniform classes statewide to make it easier for businesses to obtain a license and keep it active. This bill seeks to eliminate double taxation on businesses and allows for exemptions and credits for certain taxes paid.